The fashion world glommed onto "track" or "jogger" pants a couple of seasons ago, and they continue strong, as an alternative to the super-skinny designer looks of the last decade. The jogger pant is a relaxed but tailored pant that has room through the hips (usually elastic, or yoga/gathered waist or pleats), and tapers to a narrow cuff or sometimes even stretch band hem. It blends the slim leg with a full hip and is perfect for dressing up with a blazer and a unique blouse for work, or dressing down with a simple tee and sandals on the weekend. The print jogger pants trend picked up last season and continues strong. It's a youthful look but easy to wear for casual weekend looks for almost anyone. If you're unsure, try a tone on tone print (like gray on black) or a small print that, when you stand back several feet, almost looks like a solid color. For those of you who wish to go bold, tropical prints are big, as are animal prints like zebra and leopard. 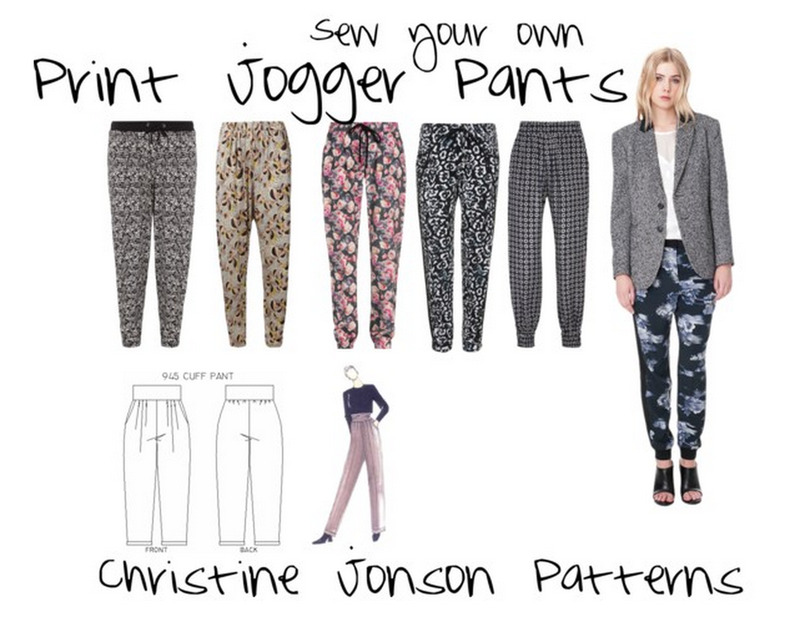 Here are some ideas for print jogger pants. You can find delicious prints in ITY, Rayon/Lycra and other knit fabrics that are perfect for the Cuff Pant. Pair the cuff pant with a canvas jacket, such as a field/safari jacket or denim jacket, for days off, and wear it with wedge sandals. For casual Friday workplaces, try a tailored blazer, a georgette blouse and printed jogger pants with wedge open toe heels or ballet flats. The Cuff Pant with the cuff at the hem dresses up the pants considerably. If you're leaving your blouse untucked, a printed pant with cuff in an ITY knit looks just like a dressy fabric and can pass as dress trousers with even a fairly close inspection! If you want absolute luxury, you can try a silk knit. For this slim leg look, take 1.5" away from the inner leg seam at the hem tapering to 0" at the crotch seam, this will make the hem and pant leg narrow. Crop the cuff at the ankle bone so it shows off your awesome shoes!